Levi lost his first tooth today. We were beginning to wonder if he was just going to keep his baby teeth lol. He turned 8 in August and still no teeth were even loose yet. I believe he was getting anxious considering his little sister has already lost 3 teeth now and has another one loose. He would check constantly for loose teeth and when he finally discovered one recently he wouldn't leave it alone until it was ready. Eating an apple today finally worked it loose enough to pull. He was tickled to death and wanted me to call everyone and their neighbors to tell them the news. 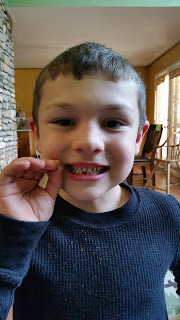 He is now asleep with his tooth under his pillow awaiting the tooth fairy.